Practicing Patience In God’s Kingdom. Someone said to me recently, “Ask the Lord for Patience and He’s sure to give you an opportunity to put it to the test”. 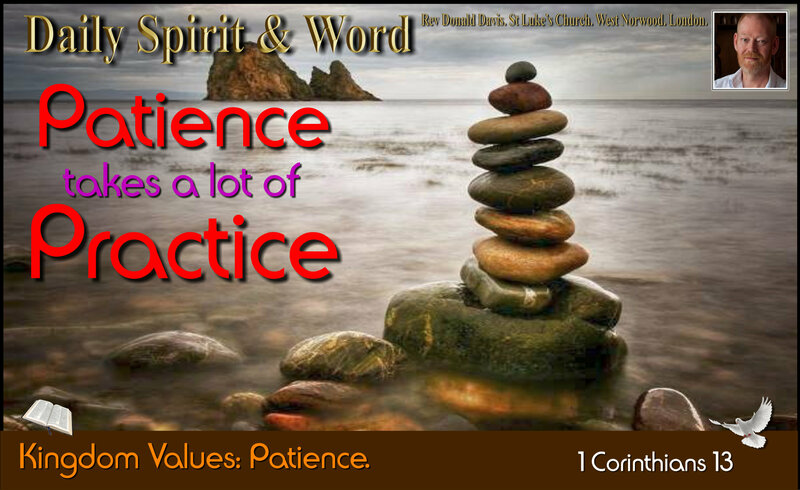 However, there is another way to BUILD up your PATIENCE. Now my friends, this is NOT easy and it’s not for the faint-hearted. A faint-hearted person is someone who lacks conviction, boldness or courage. Conviction: Are you convinced that the LORD wants you to be patient with people? Getting a conviction is a key to keeping going, to persevering, to lasting the whole race, because, being patient is not going to be easy. LOVE starts with PATIENCE and ends with PERSEVERANCE. Jesus was asked once by one of His disciples, “How many times shall I forgive someone when they sin against me?” Matthew 18:21-22. Jesus answer was totally awesome: “Not seven times, but SEVENTY times SEVEN = 490 times (In ONE DAY)… That’s an awe inspiring degree of forgiveness. It takes CONVICTION (Being convinced by the Lord). You’ll need Boldness and Courage to keep on being patient and forgiving others when they do stuff that hurts, offends or even insults you. One of the fantastic things about God’s Kingdom is this; when He tells us to do something, He also gives us the power to be able to do it. He will never leave you alone and He’ll provide all you need to live the way He wants. PRAYER: Oh LORD, Please give me the perseverance, help me not to be faint-hearted, grant me the conviction, the boldness and the courage to practice patience. I know now that I can’t do this alone, I’m just not strong enough Lord, so please, fill me afresh with the Holy Spirit, pour into my heart that awesome gift of love. Give me the desire to be different from the world’s ways and practice patience at every opportunity. I need You Lord Jesus. Amen! Be blessed today, and stay close to Jesus moment by moment throughout the day. Amen! Practicing Patience In God’s Kingdom. “Thy Kingdom Come”.